A new editorial team has been appointed to a group of Scottish newspapers after two editors stepped down as part of a voluntary redundancy scheme. Magnus Llewellin has been promoted to editor-in-chief at the Herald & Times Group from his role at the helm of The Herald and a team of executive editors will lead the other titles in the group. Neil Mackay has been promoted to executive editor at the Sunday Herald after working at the title in roles including investigations editor and head of news, while Rob Bruce and Callum Baird will hold the same positions at the Glasgow Evening Times and The National respectively. The group also said that Barclay McBain would remain as deputy editor of The Herald and Graeme Smith would be senior assistant editor at The Herald, Evening Times and Sunday Herald. The news comes the day after Richard Walker, pictured above, left his role as editor of the Sunday Herald and The National. 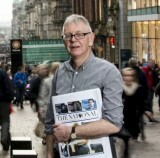 Last week, it was announced that Evening Times editor Tony Carlin was also leaving his role. Richard had his final day leading the two pro-independence titles yesterday with his departure coming as part of plans by Newsquest to axe up to 20 journalists from the Herald and Times Group. He will take up a new position as consultant editor of The National – the pro-independence daily whose launch he oversaw last year. Those taking voluntary redundancy from the titles include columnist and leader writer Robbie Dinwoodie, who will leave Glasgow-based daily The Herald after working there for 26 years, previously as political editor. It was announced in August that the Herald and Times Group was looking to make cuts because of “substantial weakness” in newspaper advertising revenue and the consultation process is now nearly complete. In a farewell piece after his departure was announced, Richard wrote that he had “loved” editing both papers and thanked readers and the paper’s journalists for their support. He wrote: “So if I love it so much why am I standing down? Well, it’s not to retire, or put my feet up. It’s not to ‘leave the battlefield’ as one message I received put it. “For a start, I’m not cutting ties with The National entirely. I’m continuing my relationship with the newspaper as a consulting editor. “I’m not giving up on the argument for independence, even if I haven’t quite worked out how best to contribute to it. And I’m not ready to give up journalism entirely. “But I feel my present job at the Sunday Herald and The National has come to a natural end. “Both papers are in a strong position. Support for Scottish independence is in their DNA. That will not change. Both have talented and dedicated staff. Both will easily go on without me, and indeed will benefit from new hands at the helm. Richard has worked at the Sunday Herald since 1999, becoming editor in 2004, and oversaw the paper’s circulation boost after it announced support for Scottish independence. Robbie has also received messages of support since his departure was revealed. Robbie has worked as a journalist since 1974, covering Northern Ireland in the 1980s, before joining The Herald in 1989.